Hi Pete, thanks for your post! I just sent you a link via e-mail to the latest versions of the instructions. Let me know if this helps. Also, FYI since you were one of our early Disney Castle customers, the printed instructions you have are likely v1 documents, which means they recommend installing the lights in a different order than the current instructions recommend. Most of this happens in the interior lighting section, so if you haven't done that yet, you likely won't notice much of a difference. We made this change in response to customer feedback. Good luck with assembly, and let us know if we can help with anything else! Hi Rob. Many thanks for emailing the instructions over, it's much easier to see what is going on now. 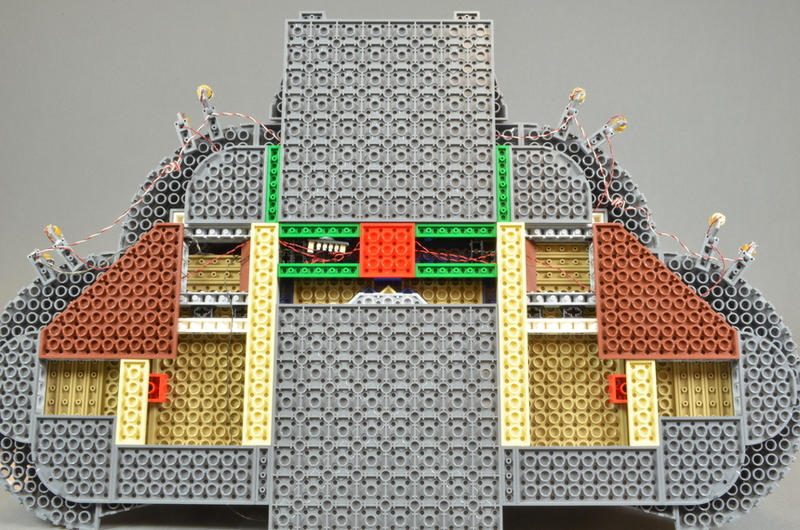 I guess what I could probably use is some Lego wiring tips and tricks for beginners, i've never done any before and it's much more technical and intricate than I expected! I don't suppose you know of any threads online where I can learn the basics do you? The only wires you should really need to fit under plates are the edge white spotlights (on the far left and right in the photo above)-- these need to have their wires come under the big brown plates and into the center for connection to the BRANCH15 adapter. And then there are the long cream-colored plates, where you need to lift the edges of the plates to get the wires under. Always try to run the wires so they pass between studs, not over/on top of them. This shouldn't weaken the overall plate structure very much. As for the wires for the color-changing spotlights, these can be twisted using a pencil or tweezers to gather up any slack, so that you don't need to hide every bit of wire with the plates. Does this help? I know Paul George on this forum has become a master of wire threading, as has Jim Pirzyk . I know Paul has completed the castle-- hopefully he'll see this mention and jump in to provide his own suggestions. Someone's making me find my instructions, eh? Step 5... and I'm also a "version 1" instructions guy. I will confess I went off-script in a number of places, though don't recall a lot of drama on the underneath wires (and mine is mounted to a lazy susan/baseplate, so wire management was important). Pete - are you looking generally for suggestions, or is there a particular wire or step/stage that's giving you fits? I suspect it must be a result of the wires slipping out of the plate grooves as i'm trying to reattach them. Is there some sort of special technique to stop that happening? 1) use a temp 1x2 plate to hold the wire on each side of the bigger plate you want to attach. I would attach the wires with the 1x2 plate first, in a spot that is not in the way. Then put the real plate/brick in place and remove the temp plates. 2) use tape or museum putty instead of the 1x2 plate above and again remove once everything is seated properly. 3) Find a similar part that you can use to swap out, so replacing a 1x2 brick with a Technic 1x2 brick, or a 1x1 round plate with a open stud (85861) for the standard 1x1 round plate. I've also used Modified plates and bricks so I can wrap the wire around the ends to help keep them in place, like 2921, 4081b, 15712, or similar. 4) Modify a part (Gasp!) I have been known to drill out holes in parts to create a place for wire. The 1x1 round plate in Trans-Yellow does not (yet) exist with the open stud (the Trans-Orange does), so I've been known to drill a hole through it to run wires. I have created a 2x3 Technic Plate. I also have been known to modify BrickStuff parts to do the same. To fit the normal extension wires through a Technic hole, I wind up cutting off the tabs from the connector ends, then it just fits. In extreme steps I will cut the wire and re-solder them after running them through a hole, like the hole in the Round Tile 1x1 with Bar and Pin Holder (20482). I also have a question on how hard are you pushing your plates in, I will say the larger the plate is, the less of an issue of it popping off. The plates that come off the easiest are usually the 1x1 round plates with the pico light underneath (see option 3). Many thanks to you all for replying to my query and trying to assist, I really do appreciate that. Having spent another couple of hours this morning trying and failing to get the lights in place under the castle base though I have to say i'm getting increasingly frustrated with what an ordeal trying to install these lights is. The picture shows what my previously stable castle now looks like after approximately 5 hours of trying to complete a single step of the assembly (no I wasn't trying to build it on that table, I was doing that on a carpet, the table is just where i've put the pieces so I don't lose any before I can put it back together) . Essentially having the castle laid on its side ruins its structural integrity as it simply isn't designed to be placed like that, and it has eventually fallen to bits. I've had to remove what little lights I had managed to get in place in preparation for rebuilding the castle. That in itself is going to take quite a while as i've no idea where some of the pieces go so i'll have to carefully check the instruction booklet again. To be honest i'm on the verge of giving up entirely on the light kit and writing it off as a very expensive lesson not to attempt anything like this ever again, it's been absolute hell so far. I do think there's a bit of an issue in terms of the classification of your light sets as kits, or at least in my interpretation of the word, which I think was a little naïve on my part. I would never even dream of purchasing individual parts from your inventory to try to light up something i'd created, as I know full well that that is something that is way outside of my capabilities, but because this was advertised as an add-on kit to a Lego set it implied (at least to me) that installing it into said Lego set was a relatively simple process that even a novice who has never lit up a set before would be able to manage. I certainly thought it should at least be in the same ballpark difficulty wise as constructing the Lego set the light kit is an add-on to, and that really isn't the case. In hindsight making those assumptions was probably a little foolish of me. I can totally understand that to someone who has the technical capability and fine motor skills required to solder wires to tiny circuit boards the installation of that set of lights into a Lego set would be comparatively a piece of cake, but the whole beauty of Lego sets is that they are designed in such a way that any idiot can create wonderful things without much struggle, and it's quickly becoming clear to me that the same doesn't apply to Lego wiring. There's a very steep learning curve that is liable to leave the average person feeling very frustrated, and I do think that probably needs to be acknowledged somewhere. Don't get me wrong, I'm not criticising your kit as what you've created clearly looks wonderful when installed, and it's in no way your fault that I don't possess the required skills to do that, but I do feel there should be a warning sign somewhere that Lego lighting even in kit form is a very advanced procedure, and that you're crossing into the territory of master builders who can do things like modifying Lego pieces without ruining them and just plain wing it when necessary. That's not necessarily a bad thing if you know what you're getting into and are ready for the challenge, but if you're not it definitely comes as a bit of a shock! As I say please don't take this the wrong way, this isn't intended as a complaint as the misunderstanding of the technical ability that would be required to install the kit is completely of my own making. It's hard to find fault with either your customer service (which has been excellent) or your product, only with my own faulty logic and stubby fingers. I'm just disappointed that the kit is far too difficult for me to cope with, and I feel I should serve as a warning that it might not be suitable for the average Lego fan who has never attempted anything like this before. I think in future i'll have to stick to admiring your impressive work rather than attempting to re-create it myself! Pete Hi Pete, thanks for sharing your frustration. I can see you're likely at your wits' end, which is never something we like to see. 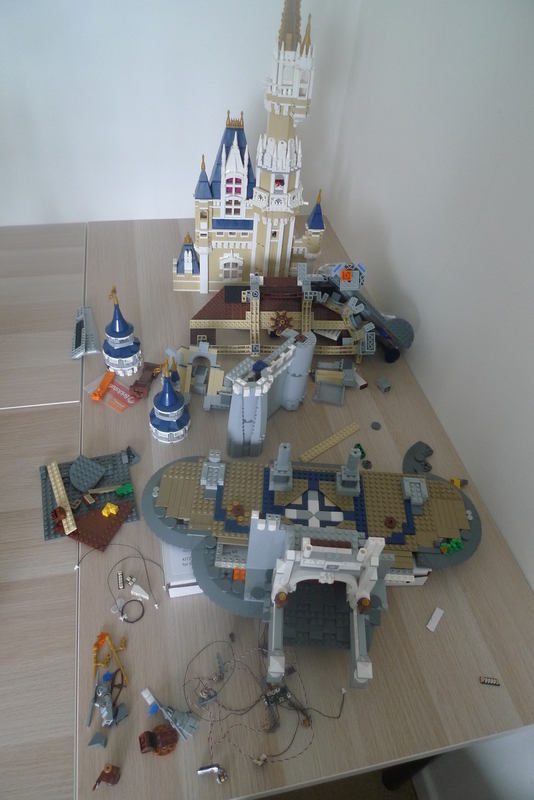 In the photo you shared, your castle is in many more pieces than we'd expect to see. I wish I could teleport to your house and install the lights for you 🙂, but failing that, we'd be happy to take the kit back and issue a full refund. This kind of experience is not what we want our customers to have. I'll send you a direct e-mail so we can start the return process. Again, our apologies that the kit was not what you expected. K8 Sure, send us an e-mail to info@brickstuff.com and we'll send a link to download the latest copies. So this thread has me a bit confused. Is there really soldering of wires to circuit boards involved in setting up the light kit? Christopher Nicholson not at all— everything is pre-wired by us. Our system is plug-and-play— no soldering needed. As you can tell from reading this thread, however, this is our most complex kit to install (largely because the Disney Caste kit itself is highly complex and somewhat fragile). We aim to deliver the most realistic final installation possible, which to us means designing the installation instructions to conceal as many wires as possible. As you can see above, some of our customers have elected to modify some bricks to route wires, but this is not required (we didn’t modify any bricks for our in-shop demo model). I hope this helps explain— please let us know if you have any additional questions. Lorna Stern Hi Lorna, I'll send you a link to download a PDF version of the instructions. Hopefully this will help-- the main power cable comes in under the base of the castle and then up through the base to the area above and behind the main front door, where the master effect controller is mounted. Look for a direct message with the link to download. If after seeing the PDF copies you are still having trouble, just let us know. Thank you. I received your Disney Lighting Kit quite a while ago and had to set it aside due to other issues. I'm getting back to it and I am confused about certain steps. Mainly when going from Step 14 (end of Midsection Color-Changing Light installation) and continuing on from there. I never see a reference to Bag 3 lights EVEN though I believe I see them already installed in the picture above Step 13. Perhaps there has been an updated set of instructions that covers this. Thank you for your help in this matter. I'd appreciate the instructions in PDF form as well. Rick Moser Hi Rick, thanks for your question, and sorry for the confusion. You are correct-- the photo above Step 13 does show the white spotlights already in place. You're actually the first one to point this out-- we didn't notice it ourselves. You can complete Steps 13 and 14 without the white lights mounted, because these are actually covered in the very next section (Step 36 tells you to mount the white lights), so it won't be a technical issue to not have them mounted in Step 14 (though I agree, it is confusing). We will make these changes in the next update of the instructions. I hope this helps explain, and I'll send a PDF copy of the instructions directly. Rob Klingberg hi I lost my manual for the Disney Castle installation for the interior and exterior bundle with fiber optic add on, could I please get those instructions please? Jon Pahta Hi Jon, certainly! I will message it to you directly via this forum. Rob Klingberg Hi Rob and thank you for timely replies! So I completed the exterior lighting and wow yes it works! Yay! However, I have one issue; when I finished completing the exterior lights, I had one extra black 6 inch 2 plug wire leftover and I had no power to the Color-Changing Effect Controller. So I used the left over black wire and connected it to the A4 Adapter Board that connected to the power in cable. That fixed the lights but the remote doesn't turn off the color changing lights or the lower spotlights. So I missed a connecting step to the color changing lights and lower spotlights and so those lights are by-passed from the remote infra red receiver coming off the main control module. As a work around I connected the black cable from the main module to the the second power input/output on the color changing module which fixed it as far as turning off all the lights with the remote, however, now button C doesn't do anything. I can't figure out where I missed the step of somehow connecting the main module via A4 boards to the effects controller, Argh. Any ideas, beside starting from square one? Jon Pahta Well after typing the previous message and I just happened to be re -re -re- reading the instructions, I figured out my mistake. In step 11, I missed the fact (stated in the blurbs) that I needed to connect a 2-wire cable to the Main Control Module's OUT4 plug. Yet this is not depicted in any subsequent pics or steps and the pics can be at times misleading, me thinks. And so after carefully following the instructions, it works great, I love it! Really worth the effort and ready for the interior lighting and fireworks add-on. I just ordered the split level multi-color add- on so I can't wait. Tips for newbies, I recommend taking notes/highlighting everything that is written AND reading word for word everything written cause the answers are there. I wish you guys would make a walk-through video of your product installation to because there are nuances and not so obvious solutions to make installation a bit less puzzle tasking, sorry! But I love your products. Any future ideas for the Saturn V or Aston Martin Lego sets? Jon Pahta Hi Jon, thanks for your questions and feedback. We're planning an overhaul of the instructions for the Disney Castle in early 2019, and I agree that a walkthrough video would help. It would be a huge effort to make it (we'd have to remove the lights from our castle and basically re-install everything), but I agree it is needed. And yes we are planning many new kits for 2019, including the Aston Martin-- with sound! Stay tuned. Hi and thank you for your support. I may have missed this but I'm onto the interior lights and didn't see another remote control. Does the remote I received with the exterior lighting control the interior too. And multi-level lighting and fireworks? Thank you! Jon Pahta Hi Jon, the one remote controls everything. Hi, finally getting around to the top tower but I'm missing an A15 board. I've triple checked and I don't have an A15 board for interior lights step 27 (so I took it from Bag #2) but now for step #39 I don't have any A15 Boards available. Not sure if I did something wrong or I'm missing one. Can I order a A15 board? Just fyi, I ordered 2 A15 boards incase for 46 bucks from you. I really need to finish this project for my wife by V-day! I don't know how many I need but I didn't want to take any chances. Hi I was wondering how to attach the spotlights of the castle without them always falling off (Do you glue them on).